4,364 grt; 5,885 dwt; part-reefer. Operator: Transmarin Hamburg GmbH, Hamburg, W Germany. Built: 1961 by A/B Finnboda Varf, Nacka, Stockholm, Sweden. Yard no 374. Main engine: five-cylinder, two-stroke Fiat B685S of 4,650 bhp at 140 rpm. Speed: 15 knots. On delivery chartered to Cunard Line, Liverpool, renamed MARONIA. 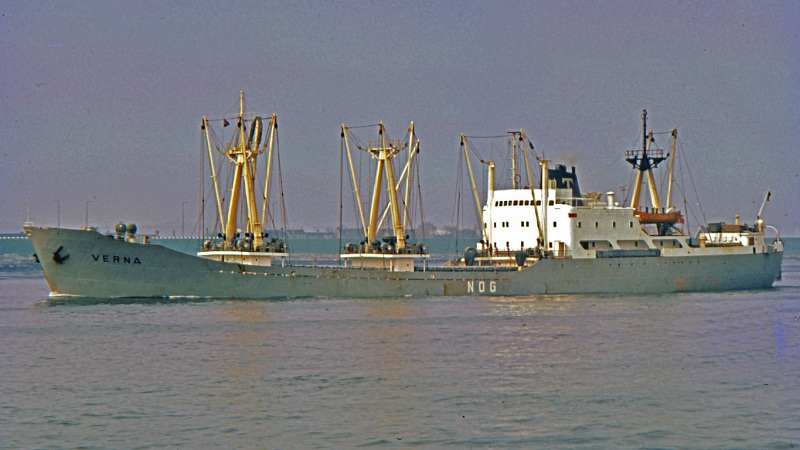 1963-end of charter, renamed MARION. 1965-sold to Transmarine Hamburg GmbH, Hamburg. 1972-transferred to subsidiary company Verna Shipping Corp, Willemstad, Netherlands Antilles (name unchanged). 1979-sold to Lecanvery Bay Shipping Company Ltd, Piraeus, Greece (name unchaged). 1982-sold to Aegis Navigation Enterprises SA, Panama, renamed AEGIS. 1983-sold to Maldives Shipping Ltd, Male, Maldive Islands, renamed MALDIVE VISION. 1984-sold to Northern Atolls Shipping Ltd, Male, Maldive Islands, renamed NORTHERN MOON.